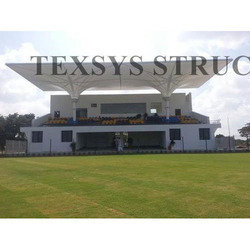 We are a leading Manufacturer of fabric tensile structures, car parking tensile structures and gallery fabric structure from Chennai, India. 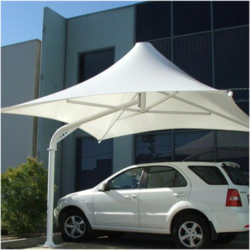 We are counted amongst the foremost supplier of superior quality Fabric Tensile Structures. Designed to meet the building code requirements set forth by the governing body where the structure will be used, these structures are manufactured by using premium quality raw material and sophisticated technology. The offered structures are tested by our quality examiners on varied parameters so as to ensure their durability. 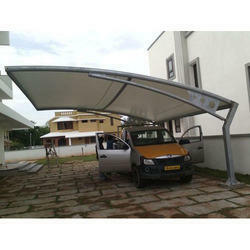 We bring forth for our clients an extensive assortment of high quality Car Parking Tensile Structures. These structures are manufactured by our skilled professionals using superior quality raw materials and latest technology in sync with set quality standards. Moreover used as a roof in various commercial and housing buildings, these structures are made available to the clients in various sizes, shapes and dimensions according to the demands of clients. We are among the well-known supplier of an excellent quality range of Gallery Fabric Structure. Used to cover the open spaces like terraces, balconies, and farm houses, offered structure is manufactured using the best grade raw material and modern technology under the guidance of our skilled professionals. We provide this structure in various sizes and enchanting color combinations which brighten up the entire exterior space.